LIQUI-MOLY has improved its dialysis unit for replacing automatic transmission fluid. Draining a torque converter automatic transmission via a sump plug never worked because the torque converter drum itself retained most of the fluid. That is why it has to be simultaneaously drained and replaced at precisely the right temperature and pressure by a dialysis machine. LIQUI-MOLY has now made the process fully automated with its new Gear Tronic II unit. 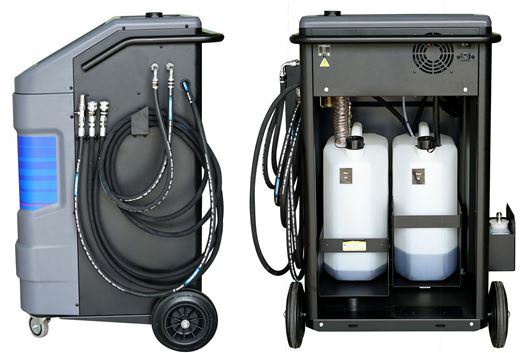 "This makes an ATF change a cinch and is no longer reserved only for specialist garages," says David Kaiser, Head of Research and Development at LIQUI MOLY. An oil change for automatic transmissions is far more complex than a motor oil change. In a motor oil change the drain plug is opened and the entire oil can flow out. If you do that with an automatic transmission, a lot of used oil will remain in the transmission – up to two thirds of the total amount of oil. Gear Tronic II makes it possible to replace the entire transmission oil. Depending on the vehicle, access is either via the dipstick guide tube, the hose connections to the transmission oil cooler or directly to the transmission. The delicate simultaneous emptying and filling of the transmission takes place fully automatically and does not have to be supervised. The menu navigation via a touchscreen takes place with computer support and is particularly intuitive. In order to relieve the mechanic's work load, the Gear Tronic II has a vehicle database that shows which transmission oil the respective vehicle needs and the capacity. This simplifies the work routine and protects against faults and expensive claims. Cleaning and care additives can also be integrated into the Gear Tronic II service, which makes technical sense and means an additional income stream for the garage. The predecessor to Gear Tronic II was launched onto the market by LIQUI MOLY in 2015. It immediately developed into a sales hit as garages were able to use it to expand their services to include automatic transmission oil changes that they could not previously do except by dropping the transmission sumps. Gear Tronic II will be showcased at stand K85 at Automechanika Birmingham from 5th to 7th June. LIQUI MOLY can be found at stand K85. Why is the process described as dialysis? Nothing to do with dialysis which involves two liquids separated by a semi-permeable membrane that allows ions and small molecules to pass through. Sounds a sinch. Expect multiple claims by owners in a few years when their auto boxes fail and they blame this 'unsupervised' process as being at fault.